^ a b c d e Noble (2009), p. 146. ^ Cenni (1735), p. 6. ^ Mann (1903), p. 362. ^ Mann (1903), p. 367; Duchesne (1886), p. 470. ^ Duchesne (1886), p. 472; Jaffé (1885), p. 285. ^ Noble (2009), p. 145. ^ Mann (1903), p. 372. ^ Mann (1903), pp. 372–373. ^ Hefele (1896), p. 333. ^ Landon (1909), p. 98. ^ a b c d Mann (1903), p. 373. ^ McKitterick (2008), p. 300. ^ Hefele (1896), p. 336. ^ Duchesne (1886), p. 475, l. 23. ^ Mann (1903), p. 373–374. The scholar of Canon Law, Stephan Kuttner, points out (p. 149) that this statement of candidacy applied to deacons and priests of the Church of Rome, not priests and deacons generally. This is also the first occasion on which the term cardinal priest is used. ^ a b c d e Mann (1903), p. 374. ^ Hefele (1896), p. 337. ^ a b c d e f g Mann (1903), p. 375. ^ a b c Noble (2009), p. 147. ^ Hefele (1896), p. 334. ^ Hefele (1896), pp. 334–336. ^ McKitterick (2008), p. 302. ^ Hefele (1896), p. 335. ^ His name is given as Radoinus in the Liber Pontificalis: Duchesne (1886), p. 474, l. 11. ^ His name is given as Stephanus in the Liber Pontificalis: Duchesne (1886), p. 474, l. 25. ^ His name is given as Leoninus in the Liber Pontificalis: Duchesne (1886), p. 474, l. 29. Cenni, Gaetano (1735). 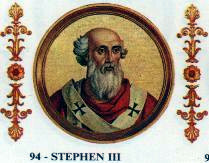 Concilium Lateranense Stephani III. an. 769 (in Latin). Rome: Typographie Vaticana. Duchesne, Louis, ed. (1886). "XCVI: 'Stephan's III'". Le Liber pontificalis (in French and Latin). Tome premier. Paris: Ernest Thorin. pp. 468–485. Hefele, Charles Joseph (1896). A History of the Councils of the Church from the Original Documents, Vol. V. Translated by Clark, William R.
Jaffé, Philipp, ed. (1885). Regesta pontificum romanorum: ab condita ecclesia ad annum post Christum natum MCXCVIII (in Latin). Tomus primus (editio altera ed. G. Wattenbach ed.). Leipzig: Veit. pp. 283–288. Landon, Edward Henry (1909). A manual of councils of the Holy Catholic Church, Volume 2. p. 98. Mann, Horace K. (1903). The Lives of the Popes in the Early Middle Ages, Vol. I: The Popes Under the Lombard Rule, Part 2, 657–795. Noble, Thomas F. X. (2009). Images, Iconoclasm, and the Carolingians. University of Pennsylvania Press. This page was last edited on 15 April 2019, at 21:03 (UTC).